You’ve probably seen them or possibly used one. I’m talking about those vibrating platform devices used in fitness centers, athletic training rooms, and physical therapy offices. The rationale behind these devices is to perform mild exercises while the device vibrates at various set levels of oscillating intensity. The manufactured vibration stimulates the receptors in the muscles (muscle spindles) thus causing them to work harder. Coupled with the performance of basic movements such as pelvic tucks, squats, abdominal contractions etc, more muscle fibers are recruited and fatigued. Therefore, more muscle fibers are trained. Before moving forward, many of the references you will come across refer to this endeavor as "whole-body vibration." A four-week study on posture, published in 2014 in PLOS ONE, was performed on four groups of young men males (N = 28) to determine both the short- and long-term effects of whole-body vibration. Three of the four groups exercised on a vibration platform with different parameters. The subjects were exposed to vibrations three times each week. A stabilograph (a device that measures body sway) was used pre-study, following a single whole-body vibration session, post-study immediately following the last prescribed set of exercises after four weeks, and one week after all training ended. Over the long term, vibration training significantly shortened rambling and trembling motions in a frontal plane. The lengths of these motions decreased significantly following the one-week post-study. The value change of the center of pressure path lengths in both sagittal and frontal planes were statistically insignificant. Based on these results, researchers concluded that long-term vibration training improves posture stability of young men in the frontal plane. ​Vibration therapy has numerous overall health benefits. There is a lot of evidence pointing to the benefits vibration therapy could provide to people who suffer from back pain, especially in the lower back. Most people will experience back pain during their life, which means vibration may play a larger role in the overall health of everyone. Lower back pain is hard to diagnose, but a common cause is a weakening of core postural muscles. This can occur when people sit at work because that action tightens some muscles while it weakens others, putting stress on your back. Prolonged sitting — which is a problem for many of us who work behind a computer most days — can make the problem worse by causing a lumbar extension that will disrupt the joints in your back and cause pain. Whole-body vibration therapy can strengthen and reinforce many of these muscles in a comfortable environment that does not put pressure on your back or cause it to rotate while already under strain. This benefit can help you strengthen your back and get it ready for a longer workout, helping you improve your back health for the rest of your life. Vibration plate therapy may also relieve back pain because it can lead to endorphin release, easing pain and giving you a sense of reprieve as you improve your muscles. Low impact exercise is very important for people with Arthritis. When exercising with arthritis you have to focus on certain movements and an overall balanced workout for your whole body, not just the area affected by arthritis. A common mistake is to focus on just the area that is in pain. This can be a big mistake because you will throw your body’s balance off, potentially overwork the problem area, and can actually perpetuate the arthritis causing inflammation or cartilage deterioration. It is important to focus on range of motion, strengthening, and aerobic benefits when exercising to benefit arthritis. A mini trampoline is often recommended for an arthritic rehab workout. Bouncing lightly on the rebounder helps stimulate lymphatic drainage. Whole Body Vibration can provide these same results, but in a much shorter amount of time. For example: when standing on a vertical vibration platform that is set for 20 HZ your muscles are contracting and relaxing 20 times per second in response to the vibrations. This is like jumping 20 times per second on a rebounder. The vibration stimulus travels straight up through the body. Your whole bodyweight is being mobilized to circulate lymphatic fluids. This creates the same benefits as a rebounder, just in a much shorter amount of time. Exercise can reduce pain and disability by decreasing muscle inhibition and by improving local circulation. Arthritis sufferers tend to not adhere to an exercise regimen due to the discomfort associated with working out. The more difficult the exercise, the less likely they will do it. Whole body vibration is particularly suited for these people because it exercises the postural system. WBV is easy to use, the exercise sessions are short and best of all it is safe. 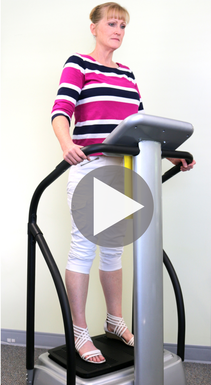 Whole Body Vibration is a great option to relieve arthritis pain and suffering. The next study we will look at was also published in the Journal of Strength and Conditioning Research and examined the short-term effects of various barbell squat protocols (using post-activation potentiation) on jumping ability, with and without whole-body vibration. Fifteen college athletes were used in the study (Average = 2o years, 178 lbs., 5 - 10.5"). Countermovement jumps for three trials and a best drop jump following three conditions. Parallel squat with 80% a 1RM without vibration. Parallel squat with 80% of a 1RM while on a vibration platform. Each condition was performed for either one set of three repetitions (low volume) and three sets of three repetitions (high volume). The protocols were followed by both one- and four-minute rest periods. 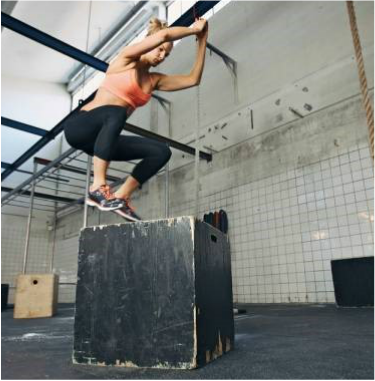 Study results showed significant improvements in the countermovement jump height following the four-minute recovery and the low volume protocol. The largest improvement involved the 4 minute rest and Vibration condition. In addition, there was significantly lower performance of the drop jump observed following a one-minute recovery for the parallel squat without a vibration condition following both the low and high volume protocols. In this study the researchers concluded a four-minute recovery was optimal for improving jump height. Also, performance of the drop jump following the squat and whole-body vibration improved the most dramatically. Whole-body vibration effect on Fibromyalgia pain. Thirty-six (36) women with FM (mean +/- standard error of the mean age 55.97 +/- 1.55) were randomized into 3 treatment groups: exercise and vibration (EVG), exercise (EG), and control (CG). Exercise therapy, consisting of aerobic activities, stretching, and relaxation techniques, was performed twice a week (90 min/day). ​Following each exercise session, the EVG underwent a protocol with WBV, whereas the EG performed the same protocol without vibratory stimulus. The Fibromyalgia Impact Questionnaire (FIQ) was administered at baseline and 6 weeks following the initiation of the treatments. Estimates of pain, fatigue, stiffness, and depression were also reported using the visual analogue scale.